While developing the Top Church Search Rankings service, we tested the online church marketing tools of the service on some church websites. We achieved results which went beyond what we were expecting. To give a better understanding of what kind of impact the Top Church Search Rankings service can have as marketing for church websites, we wanted to share the information about some of the church sites we tested. 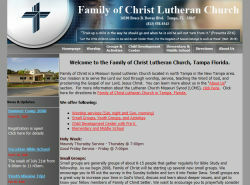 Family of Christ is a newer Lutheran church in the Tampa area. Being a part of a traditional denomination, Family of Christ has made some steps towards modernizing their approach to worship and evangelism (they have had both traditional and contemporary worship services for several years), but would not be considered on the forefront of online marketing. They have had a website for a few years, but, like many churches, have had issues keeping their website updated and the congregation doesn’t use it much. They knew that a website could be a good tool for their ministry, but until recently it’s been an under used tool. When we approached them about being a part of Top Church Search Rankings beta test, they were interested. Their Pastor had recently attended a Pastoral conference which had a session on marketing for church websites to make your church more visible on the web and attract new visitors and reach out to people in the community through the internet. So, this was one of those perfect timing situations. We ran some reports to see how they were doing in the search engines, and found that they were not doing well. In fact, the church website was no where to be found in the local search engines. One of the ministries of Family of Christ is an elementary school, which also has a website. The local search engines were actually returning the school website for some of the church keywords, but not the church website. This, of course, wasn’t doing a whole lot of good since people searching for a church don’t want to go to an elementary school website. So, we performed the Top Church Search Rankings service on the site. Aside from the rapid rise in the search rankings, another great benefit from the service was that we were able to setup local listings for the church website, which had not yet been included in the local search engines. Also, while creating listings in the internet yellow pages, we found some listings for the church which had erroneous information. So, we were able to correct the information in those listings as well as creating new listings. After a couple of weeks of applying these online church marketing tools, the church listing started showing up in the local search engines and quickly moved to rank well above where the school website was ranked. in the regular search results. The number of unique visitors to the Family of Christ website has nearly doubled and the number of visitors from the search engines has doubled as well which accounts for more than half their website traffic. They also are receiving additional traffic from the internet yellow page listings and review site listings. 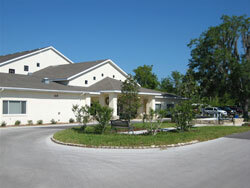 Cypress Meadows is a relatively contemporary and forward-thinking church. As such they have had a website for several years now and even recently had a custom website built by OurChurch.Com. They have about 400 weekly attendees at the various church services. These services are contemporary in nature and include praise music and dramas. They regularly engage in various forms of offline church marketing and have even run some web related campaigns. They refer to themselves as a “Seeker church” and are very focused on evangelism and outreach. 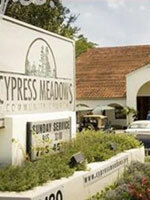 We approached Cypress Meadows about participating in the Top Church Search Rankings beta test a few months ago. Even with their online presence and focus on church marketing when we approached them about the service we found that local SEO (Search Engine Optimization) was not something they had ever thought about. After running some reports, we found that the church website was doing very poorly in the search engines for local keywords. When they saw the state of their search engine rankings, they instantly wanted to try the Top Church Search Rankings service and improve those rankings. We began the Top Church Search Rankings service and almost immediately began seeing results, even before the setup was completed. By the time the Local SEO work was completed, their search rankings for local keywords in the general search results were on fire! With these results in the search rankings we were thrilled, but we also wanted to see how this affected traffic to the Cypress Meadows website. After checking the stats for the site, we saw that in two months the number of unique visitors to the site increased by %40 and number of visitors from the search engines doubled!